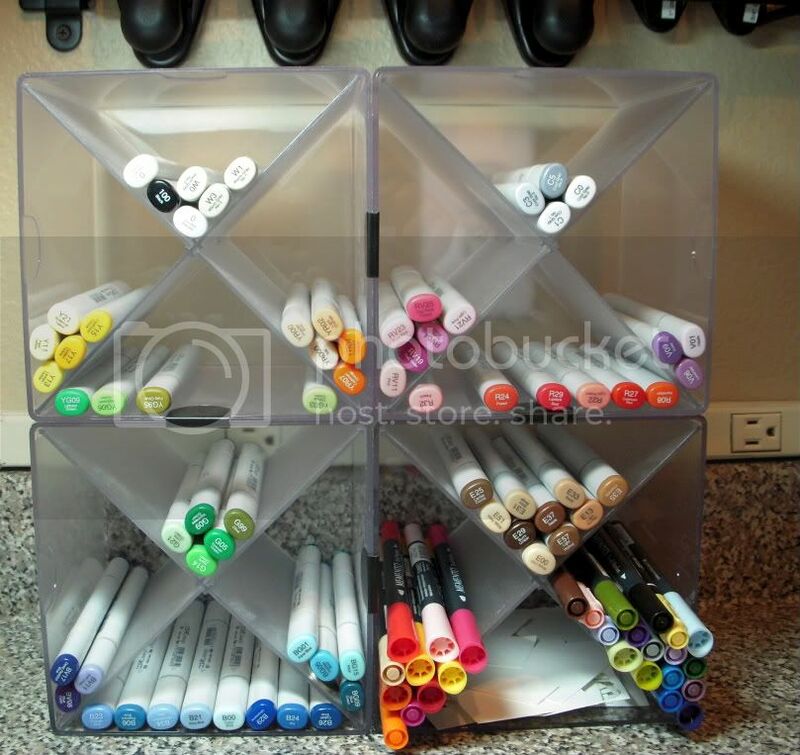 As I now have about 50 sketch and Caio Copic markers, I need an organized way to store. How do people store their Copics? Would also love to see pictures. TIA. Hi Joni. This is what I have. My husband made it for me. He made a slide in cover and put a handle on top so I can take it with me when I go visit my sister to stamp. Wow that looks great, my husband is wonderful, but not that handy! That is wonderful, May i borrow your husband? Joni this is what I have. This is four units that connect together in the fourth one I store my memento markers and small scraps of white card stock to test colors. I bought mine at Costco.com here is a link. Oh that is a possibility, thank you for the link! I see that not only is your hubby talented and handy, but oh so smart. I see there is a lot of space for adding more and more Copics! Maybe your husband could produce these as a side business????. I cart mine back and forth between home and our lake house.I am currently using a Sterlite plastic bin (from hobby lobby) that has a locking cover and a handle. It works well for now though, holding 72 Copics in its plastic base, about 12 ciaos, my spica glitter markers , watercolor markers, my Prismacolors, etc. Not sure I can fit much more in this one. Oh no- I may have to stop buying-hahaha. Theresa's is beautiful but I have no building skills. This is awesome too! Thanks for sharing the link! Great idea thanks for sharing, just had a look in Costco here in Manchester UK and they dont seem to stock them , what a let down. Have to keep mine in a box till I have a word with hubby about making a box for me. Right now I have mine stored in a basket but just picked up a new item to store them in. A local store is going out of business and I was able to talk them into selling me one of their highlighter display stands. I will take a picture of it tomorrow and upload it for you to see. It turns out the hightlighter display stand in not big enough for me to use for my copics so they will stay in the basket for now. I did use the display stand for all of my other markers, glitter pens etc... Here is pics. I got this marker tower from CTMH. Copis are a little shorter, so I stuck 1" pieces of dowel in the back. With my new markers coming monthly, I'm working on filling a second tower. Each tower holds 76 markers. Oops! Sorry the attachment is so big. I guess I'm not sure on what to do.